Saw Palmetto extract is an extract of the fruit of Serenoa Repens. It is rich in fatty acids and phytosterols and has traditionally been used to help with urinary health and particularly the male prostate gland. Saw Palmetto has been used for many centuries for a variety of ailments. American Indians used the fruit for food and to treat a variety of urinary and reproductive system problems. 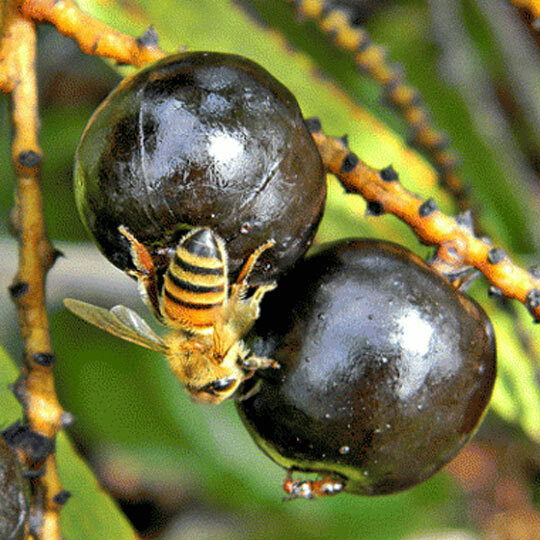 The Mayans drank it as a tonic, and the Seminoles used the berries as an expectorant and antiseptic. The most common usage in modern times is for genito-urinary problems, such as inflamed prostate (prostatitis) in men, where the prostate gland is enlarged due to infection, and for benign prostatic hyperplasia (BPH). Indeed, Saw Palmetto Extract is the most popular herbal treatment for BPH, which is a common condition in older men. Early research has indicated that the extract is well-tolerated and suggested "mild to moderate improvement in urinary symptoms and flow measures. Whereas Saw Palmetto Extract does not cure either of these conditions, it can help alleviate symptoms and is said to be an overall tonic for the urinary system. Saw Palmetto Extract is also said to be an expectorant, and controls irritation of mucous tissues - making it highly useful over the winter months when colds and flu's are more common. Non-clinical anecdotal evidence suggests it may be useful in irritative cough, chronic bronchial coughs, whooping-cough, laryngitis, acute and chronic, acute catarrh, asthma, tubercular laryngitis, and in the cough of phthisis pulmonalis. Each Active Health: Saw Palmetto Extract 500mg capsule contains a standardised extract of 25% Saw Palmetto fatty acids.